AncestorPuzzles.com: DNA Adventures- What a Week! DNA Adventures- What a Week! Is it "Time to Spit or Get Off the Pot" for you too? This is one of the chapter headings in the book Swabbed and Found by Frank Billingsley, Chief Meterologist for KPRC Channel 2 in Houston. We had a huge turnout for Frank's presentation to the Bay Area Genealogical Society last Saturday. 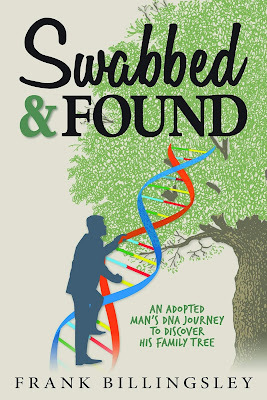 We got to meet Frank in person and hear his tale of "An Adopted Man's DNA Journey to Discover His Family Tree. Frank explained how he wanted to use the double helix and the family tree as a metaphorical image of his process of discovery. He showed his original hand drawn concept image in his slide show. 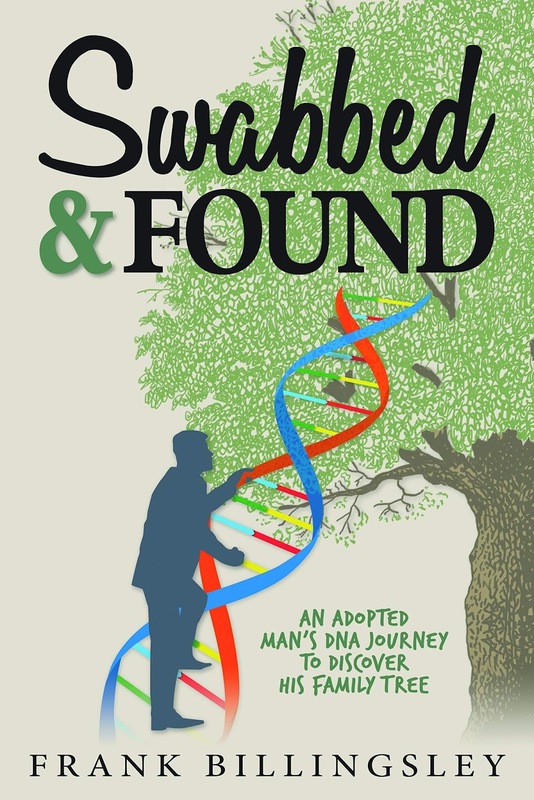 The cover art shows that the double helix is a ladder that enables you to climb your family tree. I have been climbing the DNA ladder to my family tree too. My Italian DNA matches have been especially intriguing. Italian-Americans are becoming increasingly involved with DNA testing because of the high degree of difficulty in conducting genealogical research in Italian records. And it is not just Italian-Americans that are fueling the DNA rage. Frank Billingsley cited the fact that 1.5 million DNA kits were sold by Ancestry.com in advance of Christmas this year. Place a small amount of white sugar on the tongue. I was surprised to receive your message. Yours is the first I've received through Ancestry. My grandfather (my mother's father) was Francesco DiGiorgio and his mother, my great, great grandmother, was Salvatora Roccaforte who married Angelo DiGiorgio. Together they had 9 children. It looks like Salvatora Roccaforte's father was Rosario Roccaforte and his wife is Alfia Grasso. So that would be my 3rd Great Grandparents and we may be related if this is your family. How are you related to Rosario & Alfia? In my notes I show that Rosario & Alfia had 4 children. Salvatora female, Cirino male, Vincenza female and Giuseppa female. I have more information with some birth dates and marriages. Its been a long time since I worked on my Ancestry, so I'm a bit rusty. One of my first cousins paid someone to work on the DiGiorgio lineage so I have a booklet that includes the information I wrote above. If you feel that this would be helpful, I could either make hard copies or scan and send to you. You are welcome to respond to me directly at my personal email. Take care. She emailed me copies of the research that was done and I was able to find birth, marriage and death records which substantiated what she told me. I was also able to reveal the names of the parents of her ancestor and get one generation closer to discovering our common ancestors. But the thing that really struck me about her response was that I was the first person to contact her on Ancestry. My correspondence with Louise has been very rewarding. She shared her experience of growing up in Omaha and gave me details of her trip to Lentini and Carlentini a few years back. I was able to use her information to create a virtual Roccaforte family reunion. So the bottom line is make those contacts through Ancestry.com. There is always more to the story and it will only be revealed if you make the contact.